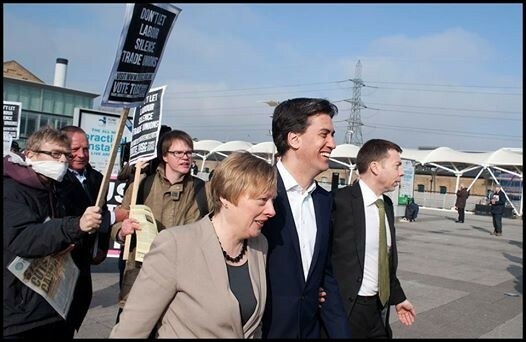 Trade Unionist and Socialist Coalition supporters protested outside the Labour Party special conference on Saturday 1st March in opposition to the Collins Review proposals being voted on inside the Excel centre in east London. Protesters had their mouths gagged and held placards saying: "Don't let Labour silence trade unions". The conference was held in Newham, the borough where trade unionist Keir Hardie was originally elected as a West Ham South MP in 1892 before he went on to become the first Labour Party leader. Former Labour MP and TUSC national chair Dave Nellist said: "Labour's real regard for the unions is shown by them devoting a mere two hours of conference to overturn 113 years of shared history." One of the speakers at the protest was TUSC's prospective mayoral candidate for Newham, Lois Austin: "Keir Hardie would be turning in his grave if he saw this conference. "I joined the Labour Party when I was 15 as I wanted to be in an organisation that fought for working class people. I was also the national chair of the Labour Party's youth wing in the late 1980s. "But socialists like me were forced out or silenced by people like Tony Blair who were backed by big business to rid the party of socialists. The Collins Review is the last nail in the coffin of trade union representation within Labour." TUSC protester Bob Severn said: "If you shop at Sainsbury's, you don't get to 'opt in' whether your purchases will end up funding the Tory party. These rules changes are about ending the remaining influence of organised working class people in Labour, to secure it as a pro-austerity, pro-big business party." 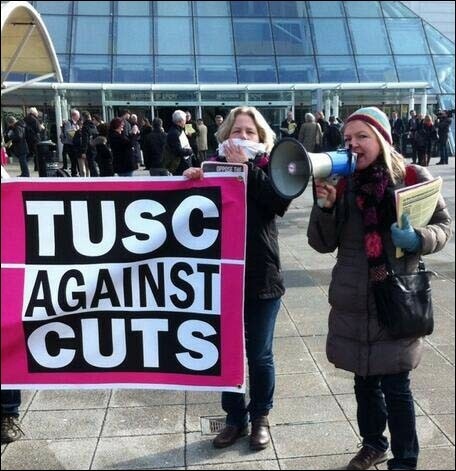 Following the conference, which voted for the changes, TUSC campaigner Paula Mitchell said: "The deed is done. TUSC welcomes trade unionists as Labour closes the door." 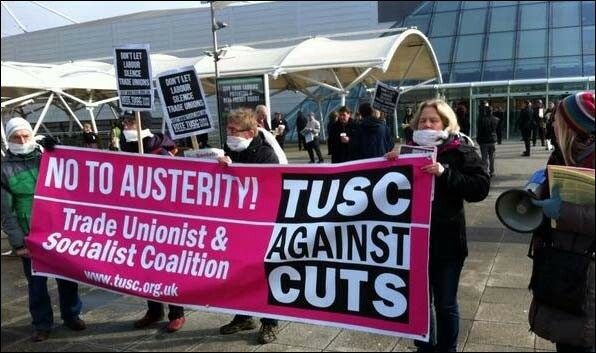 TUSC is an electoral alliance that stands candidates against all cuts and privatisation. It involves the RMT transport workers' union, leading members of other trade unions including the PCS, NUT and POA, and socialist groups. Dave Nellist is available for interviews on 07970 294 237. Bob Severn can be contacted on 07432 593 149.